This was supposed to go up on Friday, but sheesh I have been going a million miles a minute trying to do all the things for the house and for the holiday season. 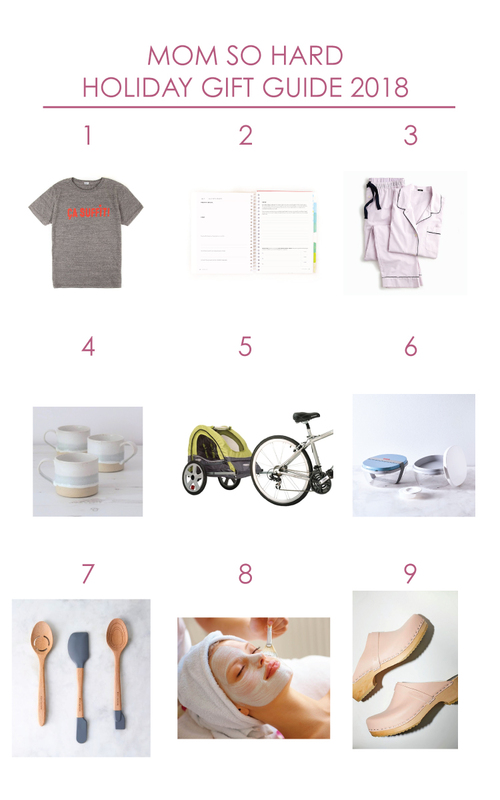 The blog has taken a back seat to life, but there is so much I am excited to share, starting with my final gift guide - Mom so hard. Because mom’s make the world go round, and they deserve some extra love for all they do, I put together a special, indulgent gift guide. Ça Suffit Tee - pronounced SAH-SUE-FIE - means "That’s Enough” in French, often used as an exclamation when someone is mad or exasperated, proceeds from this tee support one of my biggest causes, Everytown for Gun Safety. Powersheet Planner - because mama’s got big goals and needs help organizing herself to accomplish them! bike trailer - now that we live in a darling neighborhood and have places to ride a bike, I want to be prepared come spring! to-go salad container - I bring my lunch almost everyday and a high functioning container would be life changing. a facial - because I deserve it!